Summer is the perfect time to get outside and enjoy nature. And here in Lancaster County, we have a surprising number of outdoor recreation options for hikers, campers, anglers, boaters, golfers, and more. We have a variety of non-traditional outdoor activities available, too. Have you ever taken a hot air balloon ride? You can in Lancaster County! Want to try ziplining or navigate your way through a corn maze? You can give these fun things a try here, too. It’s true that one of the Lancaster area’s primary industries is tourism, which means that local residents have easy access to an array of recreation options that many others have to travel great distances to experience. Our unique local geography and proximity to the wide but shallow Susquehanna River also provide some peaceful natural areas with challenging (and some easy) hiking trails, as well as opportunities for water recreation activities. Additionally, a strong commitment to preservation keeps Lancaster County wild in spots, and while it sometimes seems like local roads are crowded with traffic, you don’t have to go far to find nearly empty forest lands. Join us as we take a closer look at some of Lancaster County’s most popular and off-the-beaten-path places to explore the outdoors. If you’re a fan of lacing up your hiking boots and hitting the trails, you have lots of choices in Lancaster County featuring varying levels of difficulty. While the world-famous Appalachian Trail doesn’t dip into the County at all, you can easily access it in adjacent Lebanon and Dauphin Counties, though there are certainly miles of other trails to occupy you a little bit closer by. The Lancaster County Conservancy is an excellent resource for discovering new trails. The majority of their properties in their current collection of 46 preserves and 6,000+ acres include designated hiking areas, and you can also pursue a variety of other activities on Conservancy lands. Horseback riding, fishing, hunting, cross-country skiing in the winter, and wildflower viewing are all on offer at different properties. One of the most popular Conservancy destinations at this time of year, in fact, is Shenks Ferry Wildflower Preserve in Conestoga Township. Over 20 species of ferns take over the hillsides in summer along the short 1.7-mile trail in addition to a diverse collection of summer wildflowers. The preserve is situated along the eastern banks of the Susquehanna, and its proximity to the water makes it a cool respite from the summer heat. While you’re there, look for toads, box turtles, deer, foxes, and some 50 species of birds, too! But back to hiking. If you’re more of a “flat and level surfaces” kind of hiker or just enjoy a leisurely walk, Lancaster County has some impressive rails-to-trails and other multi-use pathways that are sure to delight. Most notably, the Enola Low Grade Rail Trail is almost 29 miles in length with most of the distance located in southern Lancaster County. (Note that a few spots are not yet open to the public as various municipalities along the trail have followed different timelines to improving their sections.) You’ll find plenty of parking areas along the entire length of the trail where you can leave your car and hop on for a short section out-and-back. Another excellent multi-use trail, which begins near where the Enola Low Grade Trail ends is the Northwest Lancaster County River Trail along the Susquehanna. This trail winds through 5 municipalities over the course of about 14 miles and is also open to biking and dog-walking. Closely related to hiking is camping, of course, and Lancaster County is home to a number of campgrounds and RV resorts. Many locals don’t typically take the time to discover camping opportunities right next door, but spending a few nights in a tent or parking your camper at a nearby site can be a fun change of pace – especially with visiting family. Grandkids particularly love the amenities offered at some of these clean, modern properties like swimming pools and playgrounds. And favorite camping resort, Old Mill Stream Campground, just outside of Lancaster City, is right next door to Dutch Wonderland Family Amusement Park. So gather your family (pets included!) and your camp chairs and spend a night under the stars! As we’ve already touched on, Lancaster County’s location on the Susquehanna River makes it prime water recreation territory. 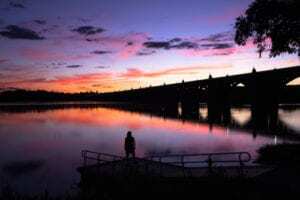 The River forms the entire western boundary of the County, and its miles of shoreline are dotted with not only scenic overlooks but public boat ramps and put-in spots. Boating and jet-skiing are popular summertime activities on the River, as are fishing and even swimming and wading in some locations, as well. In addition, the Conestoga River and several creeks, streams, and lakes throughout the county offer even more fun. Kayaking and canoeing are common activities on various local waterways, and the recently re-opened Speedwell Forge Lake near Lititz is a popular destination for those who don’t care for the high-speed, motorized watercraft often buzzing around on the Susquehanna. 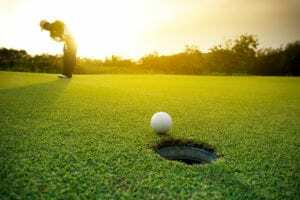 With all of the open farmland and rolling hills in much of Lancaster County, you’re probably thinking that the local area would be perfect for golf – and you would be right! Home to approximately 12 public 18-hole golf courses (in addition to several members-only country club courses), you can always get a tee time somewhere around Lancaster! If mini-golf is more your speed, Lancaster County also features a broad selection of these fun courses, as well. Village Greens in Strasburg is a local and tourist favorite, or try High Sports’ challenging course north of Lititz, or the Shack’s recently refreshed course in Manheim. Right down the road from the Shack is Lancaster County’s only Pitch and Putt course, too, at Evergreen Golf, which also features an 18-hole executive course and a unique Foot Golf course for your soccer-crazed grandkids! Not a hiker, camper, boater, or golfer? You can still enjoy some outdoor time with a more offbeat kind of activity like a hot air balloon ride! The United States Hot Air Balloon Team launches sightseeing trips just outside of Lancaster along the Old Philadelphia Pike, and all it takes to enjoy a soar over the beautiful local farmland is a reservation. You can even schedule a private, romantic hot air balloon ride for two. Ziplining is another high-flying outdoor adventure that’s perfect to try with your significant other or with the entire family. Not familiar with ziplining? This activity gets you suited up in a harness and other safety equipment and allows you to take a guided trip through the treetops suspended from cables. Suitable for kids as young as 5 years old, ziplining is a great way to have fun with the younger members of your family. 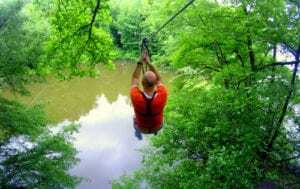 And, Refreshing Mountain, Lancaster County’s premiere ziplining destination, has tons of other fun outdoor activities on their property, too, including a community pool and high ropes obstacle course. You can even book a cabin and stay the night. It’s true that not everyone appreciates heights or flying, so how about a more “down to Earth” adventure? Corn mazes begin to open as soon as the July 4th holiday rolls around each year, and there are many for you to get lost in across Lancaster County. Cherry Crest Adventure Farm in Ronks is one of the original maize mazes, and their property features a wide range of other fun, farm-themed activities for kids and kids-at-heart. Watch a pig race, check out some tractors on display, or grab a snack at the Chuck Wagon. When your outdoor adventure in Lancaster County is done, wouldn’t it be nice to go home and put your feet up in a worry-free setting where all of your needs are taken care of? Our local retirement communities also offer their own amenities that help you spend more time getting outdoors, as well as comfortable and maintenance-free living options. After your summer full of fun adventures draws to a close, we invite you to check out our Explore Retirement Living Open House in October. Wear your walking or hiking shoes and spend another day outdoors checking out our communities’ beautiful and leafy campuses. What’s on Stage at the Fulton Theatre in 2019? Lancaster County’s Restaurant Scene: So Much More than Smorgasbords! Enter your email and receive all the latest event details for your next trip! ©2019, Explore Retirement Living. All Rights Reserved.